The Living Walls Conference is an exhibition and conference focused on street art and its role in engaging public space. The Conference will run from August 13th-15th. International street artists will make use of Atlanta's streets to showcase their work. Friday August 13th, the event will consist of a lecture series held at Georgia Tech. On Saturday August 14th, the event will consist of an exhibition and Pecha Kucha style presentations held at Eyedrum's. An exhibition of poster art, wall painting, and wheat-paste will be open in Eyedrum's galleries from August 13 through the end of September. Please check out the Living Walls Conference website as well as donate to this cause so Atlanta can host this great event. 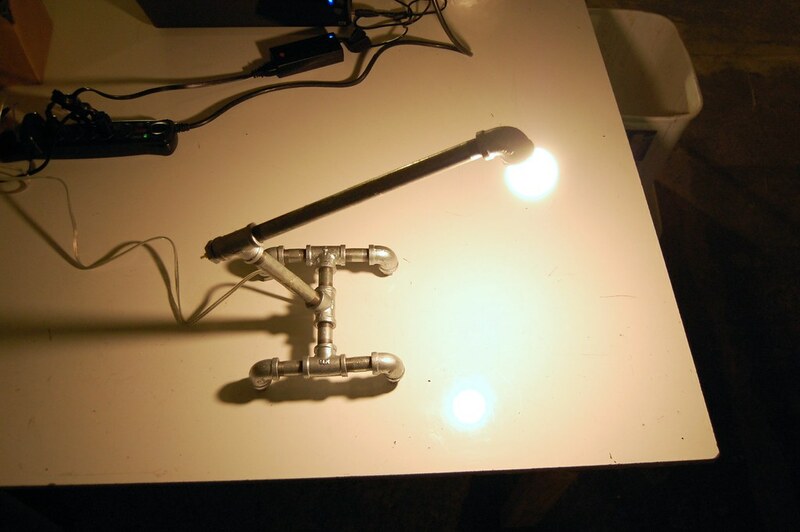 A couple weeks ago I'd seen an online image of a lamp that was created using iron pipes and pipe fittings. 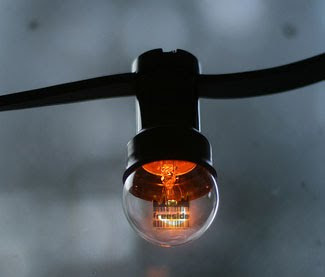 The lamp was very industrial looking but it had a price of $250.00. So for last weekends Synchronous Hackathon #7, I bought $50.00 worth of parts at the local Home Depot, used a switch we received in one of the Electronic Mystery Boxes and had some soldering help from Sparr. 2 Hours later, we had a working lamp and it saved me $200.00. We are now broadcasting on UStream, for about the next 50 hours. The synchronous hackathon is ongoing, and the West End Tours event will be going on tomorrow during the day. This weekend is a bustle of activity here at Freeside, and we welcome anyone to come and join us in hacking and festivities! Starting this evening is the premier run of 48 Hour Startup. Come this evening to mingle with other people, bounce ideas and create teams that will last for the duration of the weekend. Create a web Startup, software, or a viable hardware prototype using our rapid prototyping technologies available at the space. Create your marketing materials and a business plan, and you're successfully completed 48 Hour Startup. For more information on how this has been done before check out Atlanta Startup Weekend. Come at 7pm to mingle and create your teams, and the clock starts at midnight Friday. Second, starting May 15 is Atlanta's West End WE Tour, which includes venues such as the Metropolitan, the B Complex, and the Wren's Nest. Come take a tour of the space and watch people work on their projects, or simply come and relax with us and talk to us about what fun events and projects we have in the works. Finally, starting May 15-16 is Synchronous Hackathon #7. Link to our UStream account will be up and running soon. Come watch the madness of the 48 hour Startup and the West End Tour from the comfort of your own home if you so wish (though we'd rather you be at the space with us) or just come and work on your own individual projects. I took a bunch of photos while I was at the space recently. New artwork, decorations, projects under construction, in progress, or completed, etc. Click the thumbnails for descriptions and notes on Flickr. While browsing ebay, I noticed a lot of 2 3D printers for sale. These machines were produced in the late 90s and use inkjet print technology to print in a plaster-based powder. 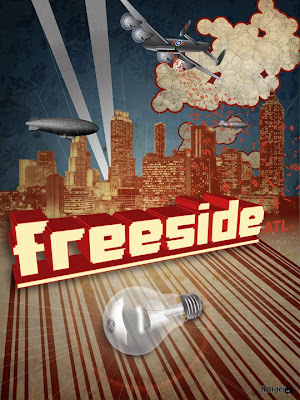 Once they arrived at Freeside Atlanta, they were unpacked and inspected. The machines were not in working condition, but fortunately all of the electronics seemed fine. The biggest problem with these printers is that the binder solution is essentially a sugary mix run through very fine tubing. If not used frequently enough, the sugar crystallizes, blocking the tubes. I spent several hours cleaning all of the piping, taking care not to damage anything or lose any of the tubing. In the end, a total of around 40 hours was spent inspecting the hardware, disassembling / cleaning / reinstalling the tubing, and very hesitantly turning it on. I am happy to say we now have one functional Z400 3D printer. Unfortunately, the material cost is rather high. I wonder if our friends over at Open3DP labs can help with that! We are currently experimenting with some of their recipes. Our second printer will be online as soon as we can fabricate a new plexiglass lid. It should be in very good shape as well, and simply needs a new ink cartridge. I am happy to answer questions and demonstrate the hardware during Freeside meetings! Click below for a video of a few layers of a print. Hopefully, I will be able to produce a complete stop motion animation soon. "Rhythm and Movement in Your Body Part III - Cranial-Sacral Rhythm"